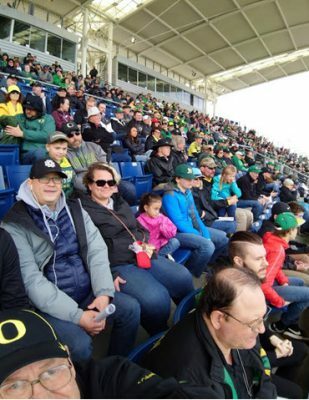 Driving to Hillsboro really had me wondering about that spring unpredictability as my car was sloshing through downpours and driving rain, and yet the fans were rewarded with sunshine and mild weather at a superb facility in an outlying community of Portland. This was much better than being at a high school, and it was nice to talk to all the Portland residents around me that were enjoying having Oregon football brought to them. Like so many spring scrimmages in the past, there are always some disappointments and some thrills, and this scrimmage was typical in that regard. Let me give my bottom lines up front, and then give you the reasons why I came to those conclusions. Mr. Platypus is a good man and a great Oregon fan. The offense is below average, with a limited upside due to scheme and method of attack. I won’t elaborate much, since I have in the past, but I will give a few insights from a FishDuck perspective. By the way — nice to be writing again. I’ve cut myself out of the schedule for a while in the off-season, as I attend to other aspects of my life that need to be handled. As we head into summer and closer to football season, you will see more of my thoughts in articles, as I have quite a few dandies to share and discuss with this wonderful community of fellow Oregon fans. It was a blast to meet up with Platypus, who you will recognize from the comments below the articles. 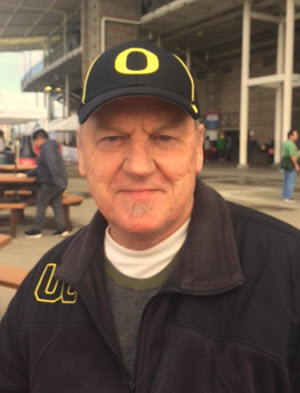 He and I don’t always agree, but like so many I’ve come in contact with — we are Greybeards who have watched a ton of Oregon football, and have a longer-term perspective that comes with being of Greybeard age. The most important thing is that we love our Ducks, and have a lot of fun discussing all that is green. We Are Going to LOVE THIS DEFENSE! Platypus pointed out how so often the quarterbacks simply had to throw the ball away as the defensive backs did not give any space and OLBs/DE were flying into the face of Justin Herbert and Tyler Shough. It was true and it was not an occasional event; often the offense turned to face a blitzer that forced a quick throw and then I realized when checking the number that it was a linebacker or even a corner coming in unexpectedly to disrupt a play. When I was driving through the buckets of rain back to Eugene … I was recalling how when the Ducks played Boise State in 2017, that Herbert never got set, and could not get into a rhythm, as he was forced to unload the ball quickly, just like what I witnessed at the scrimmage. Damn, I like what I see from this defense! Andy Avalos was a hell of a hire by Coach Mario Cristobal, and it may be the best in a very long time. I grant you that I haven’t seen much yet, but he has operated this defense for three years already. 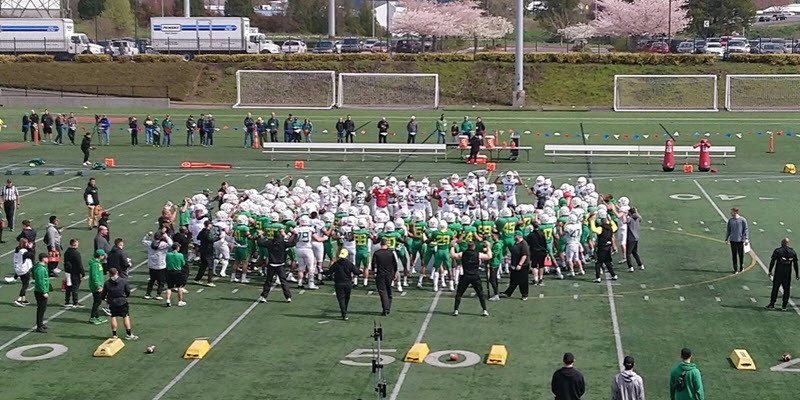 He is not guessing, or changing, or hoping things will work out, like a certain coach in Oregon’s recent past — he has a system, knows it works and is excited about executing it with Oregon recruiting. Another emphasis in the defensive drills was the focus on creating turnovers; defensive backs got a ton of passes thrown at them from different angles to catch them like any receiver would on offense. Drills to practice ripping the caught football from receivers was a surprise as well, and then we all heard about how they actually practice making the interception and blocking to make the turnover a pick-six. 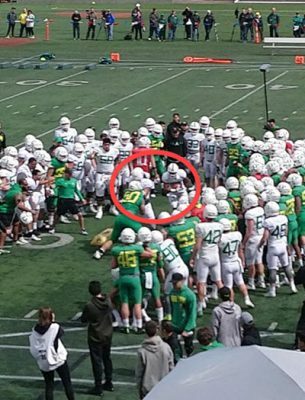 To me, this is more than just an emphasis or unique practice; this is part of a change in culture at Oregon with the defense and it was all I could do to restrain my excitement among other Duck fans in the stands that are clearly more mature and rational than I.
Thomas Graham and Deommodore Lenoir look so much different now, as the body language is that of a poised veteran who will get in your grill. They have the eye-of-the-tiger look, and I look to great things from them this year as they made it very difficult to complete passes. I was not expecting this, and it really stood out to me. The other major surprise on defense is how often we had multiple fast pass rushers making plays as many of the passes “completed” really were not as they would have been sacks. When it comes to pass-blocking … I attribute this to the defense and do not pin it on the offensive line as I think Avalos is screwing with their heads on offense. Busting through for a sack because of confusion works as well as with superior athleticism and technique from a defender! The yards in the scrimmage gained by rushing, when considering the size and experience of the offensive linemen (and considering our recent history of superior rushing teams) is a disgrace. I did not see Outside Zone Reads, Sweep Reads, Jet Sweeps or anything that would create the lanes, gaps and cutbacks we grew accustomed to seeing for a decade. Instead we saw only Inside Zones, Counters and the NFL Stretch play that Cristobal brought from Alabama. Speaking of mind games … I am having to do quite a few to myself. I love my Ducks and always support them, but cannot stomach how our tradition on offense has been trashed so quickly. But hey — enough on that, and instead let’s focus on the progress of individual players, as things can certainly only go up on offense from here. The rumors you are hearing about Tyler Shough are true; he is turning into a real quarterback displaying wisdom in when to break the pocket and when to avoid the sack by throwing the ball away. He threw a number of dandy passes and demonstrated that he can throw the bullet or the lofter when needed. This is crucial and was both exciting and a relief to observe. Cam McCormick looked like he never left the field — he looked polished and in sync to me! On one play in the seven-on-sevens near the end zone he did a very precise “in” route and caught the ball with arms fully extended and in the hands and quickly pulled the ball in for a touchdown. The defensive back was draped on him, but could not possibly reach a superb catch as that. Don’t overlook Mycah Pittman, who did not look like a newbie freshman out there. He is stout, runs good routes and makes the extra effort to make the catch. He is going to push for playing time and his body language in the drills was different than most of the other receivers. This guy looks to be a player for us! For you Greybeards — remember LaCorey Collins back in the late 90s? His body profile is what I see in new transfer Juwan Johnson, who is stout, but long. Collins was a tweener, in that he did not have the speed for receiver, and did not have the bulk to be a true tight end either. He played H-Back for us when he wasn’t injured with hamstring pulls. Johnson does not have the breakaway speed for long balls, although he might be able to simply out-jump the defenders. They threw often to him on the sidelines and to the back shoulder. A few of those were spectacular completions, but we also wasted as many attempts trying to throw to this narrow window on the sidelines. He has a massive catch radius, so why not use him as Penn State did and drag him across the middle for easy pitch-and-catches? The most incredible catch of the day was by Johnny Johnson! He was lined up to the right, about 10 yards out from the end zone, and he did a triple move that I would not have thought possible: he shoulder-shucked inside and then exploded outside. The defender quickly recovered and was at his side as he then exploded into a fade route, and while the defensive back was sprinting to get to the anticipated spot? Johnson stopped on a dime and curled back into the near corner for the catch, the TD and all before stepping out of bounds! Holy Crap! Jaylon Redd made a mind-blowing catch as he twisted behind to catch the bullet and then had the body control to spin under the ball and cradle it on his chest before his back hit the ground. This was done in milliseconds and is as good as any of my favorite receivers of the past. Redd and Ryan Bay ran some very precise routes that may have been rounded last year. More progress! I am now coming around to the concept presented by many here in the comments under the articles that without the drops by the receivers this last year — everything is changed in drives, points and confidence by all. What saw from McCormick, Pittman, Juwan Johnson and especially Johnny Johnson brings me new hope for that adds to the drama and entertainment of watching this offense improve. You probably read elsewhere about how Cyrus Habibi-Likio had some nice yards running and receiving and it does not do justice to the confidence I see in him, in addition to oozing talent that shouts to be utilized. His running yards were tough ones on Inside Zones and he caught some across-the-middle drag routes that he made look easy while gaining a crucial 12 yards. This is another example of a player who has grown and has new confidence, and I have to give Running Back coach Jim Mastro some kudos for that. We have all noted how the cadence for snapping the ball was completely predictable last year. This year, they have made some changes; you will see the quarterback shout and clap, but sometimes will fake a clap to draw the defense off. It was clever, and when used at the right moment could help keep a drive going. That is a great idea and addition to the offense! If you want to have some fun going down memory lane, try clicking and reading this scrimmage report from 14 years ago, and look at my observations and some of the names. Who is this skinny freshman quarterback, this Dennis Dixon? I have been writing these reports for 21 years now, and it was fun to see the thrills and concerns of the past. How different are we since then? As a side note, we are working on a change in the look of the site to accommodate mobile use, and the transition to being a subscriber site has been postponed indefinitely, if it happens at all. So let’s enjoy this free site that is GUARANTEED TROLL-FREE, as I relish the conversations we have in the comments and want to read everyone’s opinion. The Best for Oregon and this community of fans is yet to be!